This short list of metal detectors for under $1000 is a good example of how competitive the industry is. High priced metal detectors are what the professionals use for their jobs, so their dependability is part of the attraction to normal consumers. But you don’t have to be a professional to get the most out of the metal detectors on this list, even with models that have advanced customization options. Can Consumers Use Top Tier Metal Detectors? Is Having two Coils Helpful? High end metal detectors like the F75 are purchased by professionals that want the best of the best. Consumers that want a bump up from their current generation products also find this to be a good buy. It is high priced, but you’re getting a lot for the money. The F75 is the lightest metal detector in its class, even with its double-d waterproof search coil. The large LCD screen gives access to multiple discrimination modes, memory save settings, backlight and a numeric target identification display. When you’re searching in areas that are full of metal objects, the F75 can still correctly identify the materials you set it for. Four AA batteries are needed for full operation which goes in excess of 40+ hours on one charge. Due to the high energy demands of the device, it is recommended to only use branded batteries. You can combine variable audio pitches as cues when using trigger-actuated target pinpointing. This is helpful for distinguishing between interesting objects and the objects you actually want. Rain use is possible when you attach the battery and control housing cover, but they are sold separately. Power isn’t something you’ll be lacking with the purchase of the F75. 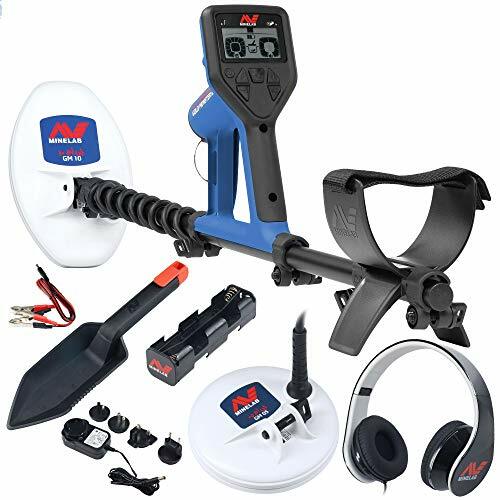 With the purchase of additional accessories, you’ll have a metal detector you can depend on for life. 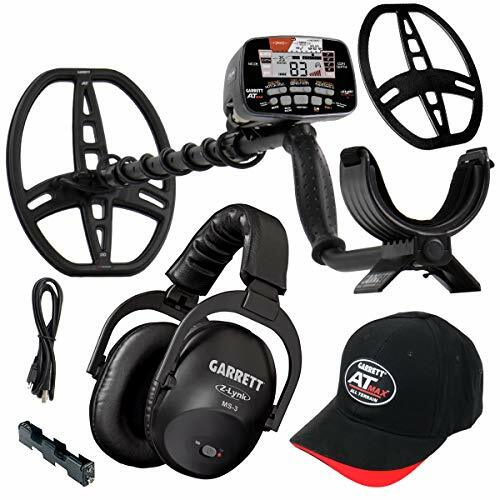 Buyers looking for the perfect all in one metal detector should consider the Garrett AT Pro. It’s high priced but has everything you need right out of the package. A two year warranty is included, so even if things go wrong you’ll be covered by Garrett. The entire metal detector is waterproof up to 10ft., which means you can safely submerse it past the coil without any issues. That is one of the main selling points of this model and the biggest reason it was featured on the television show Diggers. You won’t be at a disadvantage when searching with the 8.5×11 inch DD coil, a large improvement over previous models. Extras that define the entire product are stereo style headphones, four AA batteries, a pro pinpointer and instructional DVD. With the instructional DVD this product becomes accessible to beginners despite the complexity of the control panel. And make no mistake about it- this is one of the most complex control panels in the entire industry. Multiple audio queues are used to distinguish one type of found metal from another. With an industry leading forty level filter, you can efficiently separate the good stuff from the trash. Easily a top three product, the Garrett AT Pro is an all-terrain beast that lives up to the hype. If the AT pro wasn’t powerful enough then the AT Max might be what you’re looking for. It takes all of the things that made the previous iteration great and only adds a couple of dollars to the price tag. 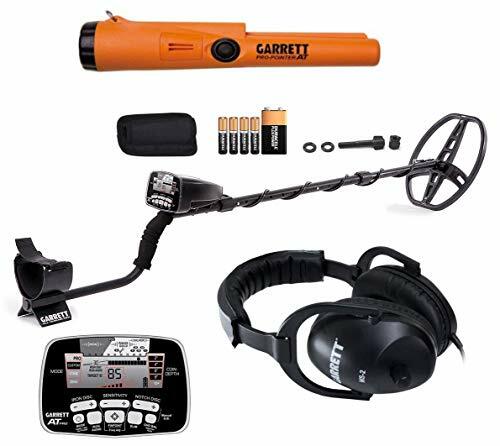 This is still a high priced piece of hardware, but it is also the most capable metal detector from Garrett. The LCD screen has been improved, using a black /red/white color template with adjustable illumination in low light conditions. Sound quality is at its best when using the included MS-3 Z-Link wireless headphones. No longer will you have to worry about knocking around wires when using a headset, and it lasts a long time before needing to have the batteries replaced. Outside of aesthetics, the control panel has also been completely revamped with more buttons, options and information displayed on the screen. This is a metal detector that is meant for intermediate users and up; beginners will have a big problem getting used to the advanced functionality of the device. The only mode that doesn’t require a lot of hand holding is the true all metal mode. It fully displays the power of the AT Max, picking up everything possible within the coil’s range. Other extras that round out the package include a Garret AT Max hat and branded batteries. Users that are serious about metal detectors swear by this model and consider it to be in a class of its own. Last on the list is the high priced Gold Monster 1000, an endearing name for a fantastic product. The Gold Monster 1000 differs from the other products on the list by offering fully automatic operation. That doesn’t mean it is without customization options, and can be in-depth when needed. 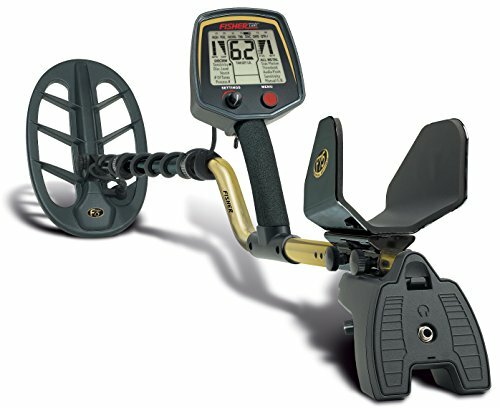 In fact this is the most adaptable metal detector on the market and is equally beneficial to beginners or professionals. With the quick adjustment features it will be a big help to buyers that use metal detectors for hours at a time. So with all of the modern consumer improvements, how does it fare when looking for precious metals? This is where things get interesting, as the Gold Monster 1000 comes with two search coils. That is double the power at a very competitive price. No compromise is made between frequency and sensitivity, and by default the quick start instructions pushes the user to try out the device in its most powerful state. Gold is still the main material this metal detector is built for, but it is no weaker in finding other available metals when you set up the filters correctly. The Gold Monster 1000 is still a one of a kind device that blends 45 kHz frequency with a speedy 24 bit signal processor. If the power doesn’t interest you, then the ease of use is more than enough to warrant a purchase. All three brands on the $1000 and under list represent an important part of the industry. This is a rare feat when you are looking at electronic devices made for hobbyists and professionals. Minelab – The only brand on the list with two search coils with one product. Searches go much better with this feature, incorporating all of the devices power into a concentrated area. Garrett – Starter kits and extras are at their best when Garrett is the brand behind them. Their headphones are the best in the industry, and also the most comfortable to wear for long periods of time. Fisher Labs – Known for their light weight and modern LCD screens, Fisher Labs has also gained a reputation for having the best memory settings. This could prove useful to buyers that let other people use their equipment. Everything is on the table when you purchase metal detectors at a high price. The $1000 and under club includes all of the exclusive features that make them the best available. Automatic Operation – Even if it seems like an option that would work well for beginners, automatic operation is also useful for professionals. It takes the guesswork out of finding the correct setting and lets you concentrate on covering specific areas. Higher Frequency – Frequency plays a big role in finding objects that are deep underground. When using filtering options, it determines the effectiveness of the device. Backlit LCD Screens – When day turns into night, having a backlit LCD makes all the difference in the world. Buyers consider this a premium feature since it prolongs the usefulness of the metal detector. Best Materials – Nothing says high tier like solid materials without the extra weight. There are many examples of solidly built products under 4 total pounds. Used By Professionals – Metal detectors in the $1000 and under category are more likely to have been featured and used by professionals. Prestige alone is reason enough to put your money into a brand, and there are plenty of big names on this list that meet this criteria. Variations in design doesn’t change much with metal detectors. For instance all of the models on this list use the ‘wrap around’ wire style for their coil. That means the wire that attaches the control panel to the search coil is visible at all times. Depending on which brand you choose, the company may go for a closed in approach with the coil wires. There are no major benefits by having the wire exposed, so it is purely a design decision carried over from the traditional look of older models. Consumers that favor the closed in look will have more luck buying a lower priced unit that caters to that specific style. Professionals aren’t the only buyers that can benefit from having an expensive metal detector. Regular consumers use the same products, and in some cases that includes beginners. So what is considered a consumer friendly product? Descriptive Manual – The amount of time a company puts into filling out the manual determines how consumer friendly a metal detector is. There are a lot of extra functions on the control panel that the user may never activate. Being able to read through the manual and get a valid understanding of the product options eases users into enjoying a top tier metal detector. Clearly Defined Buttons – Even the most powerful metal detector in the world will struggle in the hands of an inexperienced user. Products with automatic functions are the best, but in a pinch having a control panel with good labels works just fine. A large LCD screen balances everything out so that all relevant information is displayed to the user. Starter Sets – Starter sets aren’t uncommon for expensive metal detectors, but they are a little different from low priced starter sets. A bag, batteries and headphone are about all the extras you can depend on to be included out of the box. Products like a multi-function shovel or pinpointer are more likely to be extras on lower costing metal detectors. Brands like Garrett supply a two year warranty to protect their products. With metal detectors being an outside product, having a strong warranty is important. Part of the premium you pay when getting an expensive metal detector is related to the warranty attached to it. That is something that a lot of the brands have in common, right up to their fast customer support. You’ll never feel like money is being wasted when buying a metal detector for under $1000. After your warranty is up, there may be an option to extend it multiple times. Check with the company to see if this is an option that is handled by them or through a third party. Waterproof actually means ‘waterproof’ for expensive metal detectors. That means rain protection is the minimum while the maximum includes submersing the coil and more into the water. Added benefits of this feature lets you use the product on beaches, swamps, lakes and even ponds. It expands the coverage area beyond the usual setups and lets you search for objects in deeper spaces. Waterproofing also comes into play when making warranty claims. On lower priced products, water damage isn’t covered beyond the coil area. With expensive metal detectors, you have a lot more leeway with the damage protection associated with water. Garrett is the star of this section with their headphones, specifically the wireless MS-3 Z-Lynk. It is the best headphone model bundled with a metal detector, and part of only a handful of models with wireless functionality. Having wireless headphones is a big deal since the bulk of metal detectors don’t come with Bluetooth functionality. That means buyers are heavily reliant on the 3.5mm jack to plug in their own headphones. Wires are a pain when carrying around a metal detector, so any chance you get to lessen the clutter is a welcome one. The MS-3 Z-Lynk is a step in the right direction for manufacturers to make more high quality wireless accessories for metal detectors- it just took a company like Garrett to revolutionize it. Talking about audio quality might seem a little strange since it is just a row of beeps and tones. But when you’re talking about expensive metal detectors, it goes far beyond the simple sounds of regular metal detectors. Brands like Fisher have variable audio pitch which has been refined so that the control panel doesn’t even need to be acknowledged. You can set up a mode and look for objects using audio cues without needing to constantly check the screen. High quality headphones makes this mode even better, and is recommended for the most immersive experience. Audio clarity really does make a difference, even when it is simple sounds being transmitted by the device. There are pros and cons of each, with the obvious pro of the $200 models being a lower price. The short version is that kids and beginners will get a better deal with the $200 and under metal detectors. Intermediate and professional users will be better off buying $1000 and under brands. And as a beginner if you plan on using your metal detector frequently, then consider purchasing a more expensive brand since it is the smarter long-term investment. The two Garret products that made the list are the AT Pro and the AT Max. Even with the improvements made with the Max, buying the AT pro is still a smart decision. The biggest differences between the two are the headphones, with the MS-3 Z-Lynk wireless being the biggest selling point of the AT Max. Buyers that have no interest in the wireless set can settle with the AT Pro without too much of a drop in metal detector quality. Two coils are better than one, whether it is over multiple terrain types or in crowded search areas with minerals. The extra boost given by two search coils is worth it, so why don’t more brands use this technology? Although there is a boost, it isn’t significant enough that it renders single coils useless. A double coil design is a boost, not a complete overhaul of the system. It’s meant for buyers that desire that extra bit of power over the normal hardware. Minelab is the only company that is really doing it right, so choices are limited but they are at least pointing to a dependable brand. Only good things await buyers that want to spend a premium on their metal detectors. With all of the great choices on the list you are guaranteed to come away with a top tier product.